Has the ” Paraben free” bug caught you yet? And if it hasn’t.. Trust me it’s the most uber cool thing to contract. My tryst with chemical laden face washes has been a quite successful one by the way. I’ve been dousing myself with generous amounts of methyl paraben,SLES and SLS 👍🏻 which has transmogrified my facial epidermis from looking like the sweet 16’s to the bitter 26’s..
I’m not complaining of the agonising effects of parabens on my skin,because I’m worth it😒… All the pretty ads can’t be wrong eh?? When you’re fed everyday with a dose of glamour and novelty,you start being hypnotised with what’s given to you. Big brands,pretty faces,being in trend are just a few things why you choose what you choose. Realisation struck me down pretty hard this time round,and I decided that I’m going to venture into a territory of calmness,serenity and eco friendliness..Detoxing my bathroom shelves off the absurd unnecessary chemicals I’m gonna take what “Mommy Nature’s” offering me. And, my eyes fell on ” ORGANIC HARVEST”. Like they say,some people just give out so much positivity that you just can’t help but like them. Organic Harvest is one of them. Priced at Rs. 295/- for 100 ml, I feel it’s a total deal. 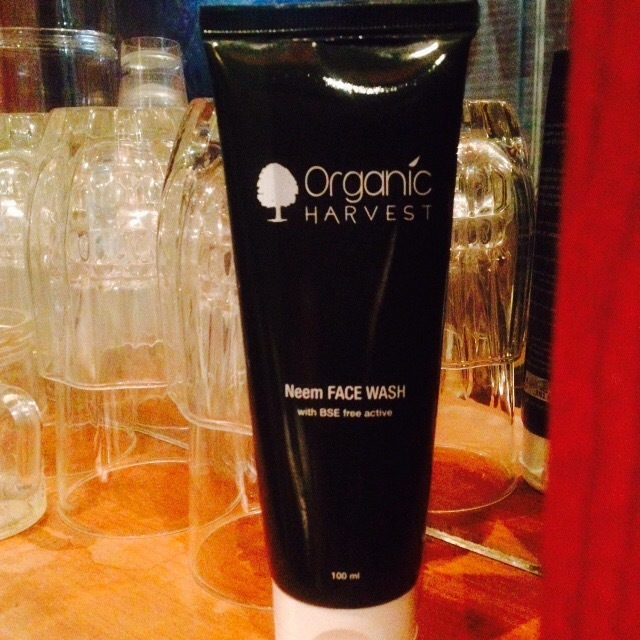 My skin before organic harvest had become a dried up autumn leaf. Pretty dry,coarse and just anything but soft.My skin anyhow, is normal skin. 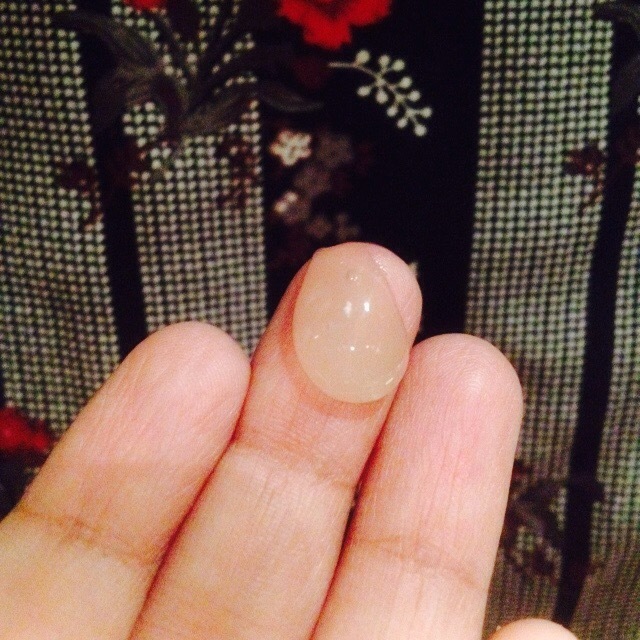 I’ve never…thank God..ever had to battle pimples or combat flakiness. My skin was always a good girl. The problem creeped in after years and years of chemicals abuse.But,post the usage of this face wash.. My skin is just how a normal skin is supposed to be. It’s not super soft,but isn’t stripped either. It’s gradually coming to a neat balance. The product contains neem,which is FYI one the miracle trees on earth. It’s got antiviral,anti microbial,anti fungal and antibacterial properties. They claim it’s a mild face wash for your skin(which it is) and that they manufacture the product using earth-friendly practices. Key ingredients: Aqua, Tamarind Seeds extract and ECOCERT certified sorbitan olivate, in cream base. 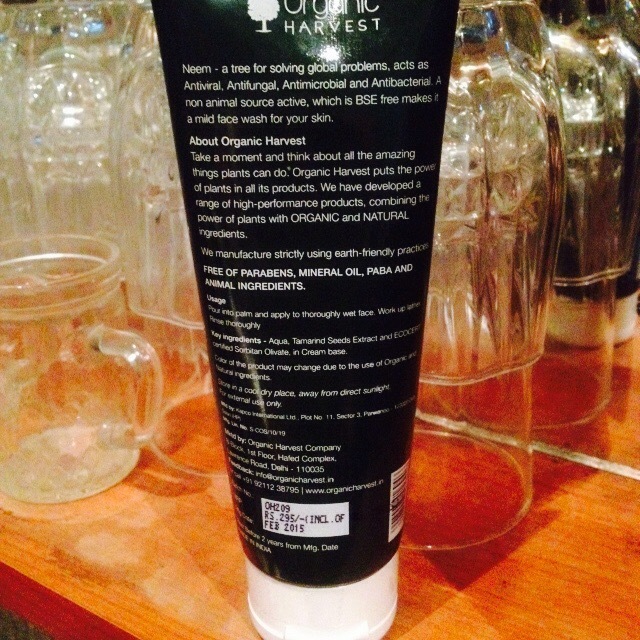 So, when a product is ECOCERT certified you can bet that it’s an organic one. So, I’m gonna give a kick in the teeth to all those SLS,PARABENS AND SLES products and give this a clearance certificate. All you need is a fat pea sized drop and your done. The product is a translucent light green liquid. It isn’t too runny or thick,kinda on the consistency of a soufflé. Doesn’t lather much,but definitely does its job well enough. Your face isn’t squeaky and stripped clean rather it’s clean and soft. You do feel a good amount of moisture left behind even after a good wash.
I,absolutely adored the product and I’m already on the second tube. It works good for a month and is worth every penny you invest. Say Au revoir to dry,patchy skin. 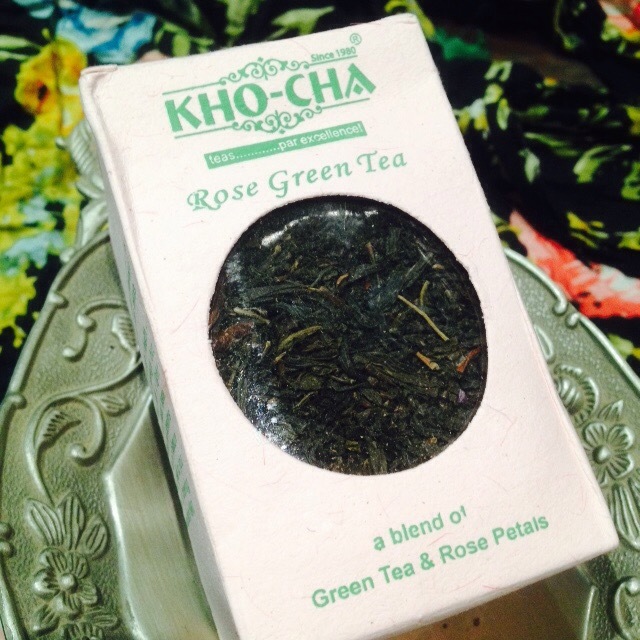 Kho-cha rose green tea review. Nothing really equals the smooth nirvana of a nice hot cuppa tea. An early morning rise or a late night gossip, nothing is complete without that little brew, which eagerly awaits you at the kitchen counter or the teapoy. Imagine finding the most perfect cup of tea and being elated with pure joy at every sip. I, for one have yet to find that perfect cup. My travels through the supermarket aisles, brings me across quite an astonishing variety of teas. 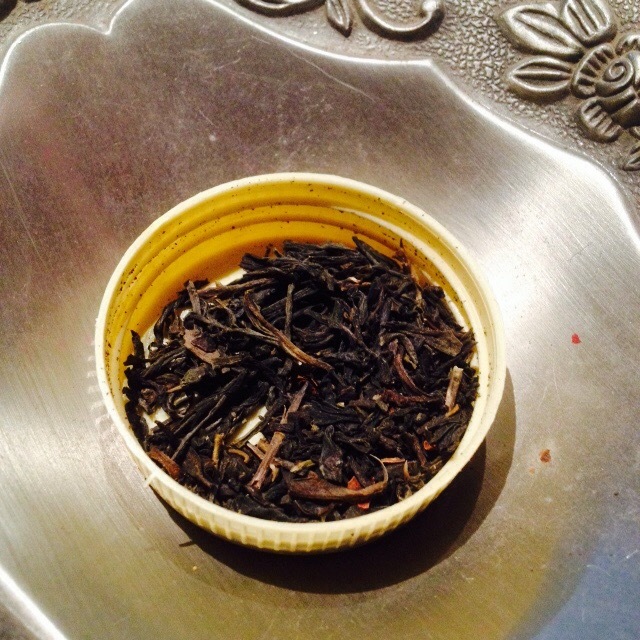 The earl greys, green teas, oolongs,black teas, flavoured tea,etc… You probably get the idea. So, here I am.. Drafting my first post dedicated to a ” tea review”. The sales executive suggested that this tea had added benefits of giving you a nice and clear complexion. A plus anyways to the numerous benefits of green tea. The packaging is quite decent. Made from recycled paper, it’s has a rural touch to it. A certain desi charm. The green tea comes in a small pet bottle,adding more of the rural finesse to it. The imagery is quite a pleasure to see. Green tea leaves curled and packed next to each other with little rose petals peeping from beneath,scores points for me. Just this makes me wanna get the teapot whistling right away. Here’s how the liquor looked after a 3 minute brew. 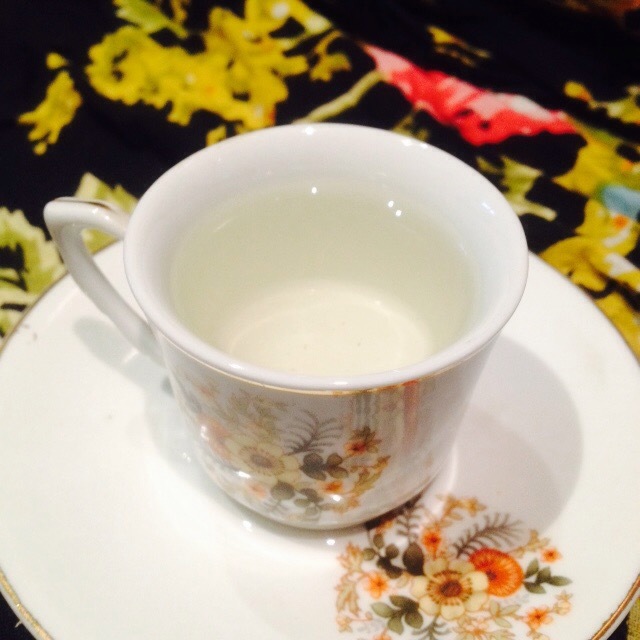 The liquor was a pale light green liquid with just faint tones of the rose petals. What made this stand apart was the lightness of the brew. The tea was anything but heavy on your palate. Felt like your drinking a nice warm cup of fresh water. No heaviness or a feeling of that deep tannin after taste. The blend didn’t work wonders for me,because I was looking for some strong undertones of rose. 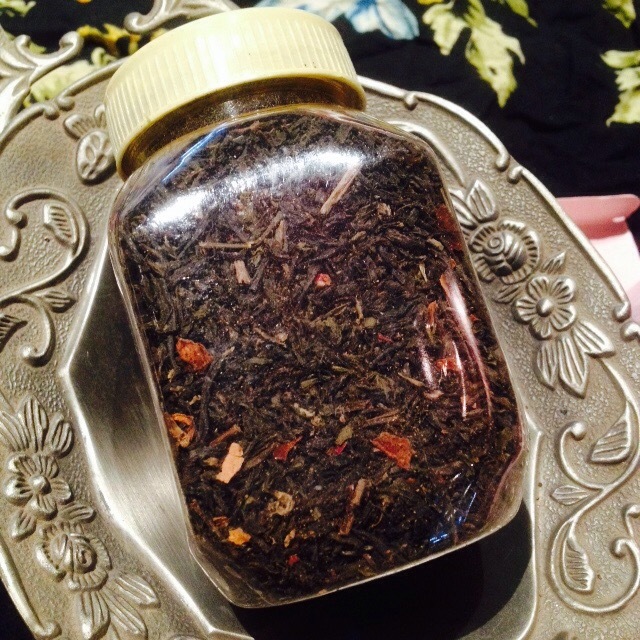 This blend just stumbled with the rosy-ness, rather it felt like delicious clear green tea. I had to add a strand of saffron to compliment the clear taste and it turned out wonderful. I give it a thumbs up for the clarity and a palate cleanser kind of a taste. Sadly, it doesn’t amuse me much when it’s claiming to impart a certain rose flavour to the brew. Costs Rs.285/- for 100 gms. I got it at buy one get one offer. Eco- friendly packaging if you are gonna excuse the pet bottle. Saves you the hassle of finding tins or containers to put the tea in. Behaves like a palate cleanser too. 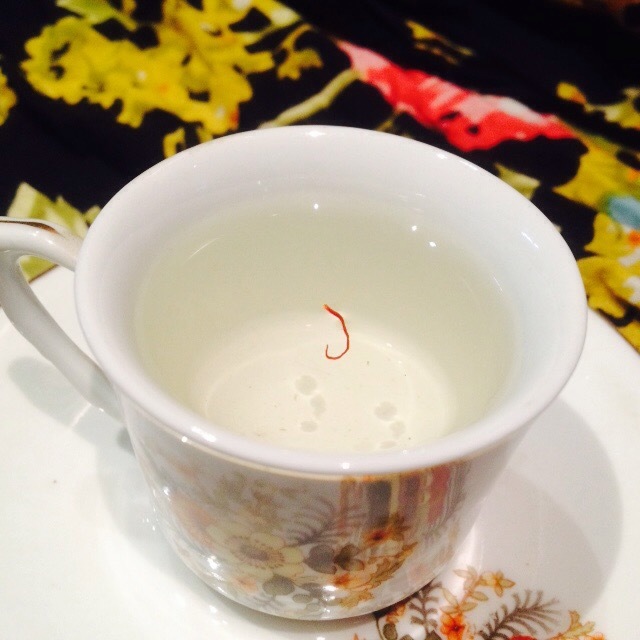 It can be used to build up other flavours.A neutral taste is what this tea promises. I use this tea as a base for masala chai. Not a rose tea for sure. Extremely faint undertones of rose. Doesn’t come with freshness seals. Hmmm.. Yes, that’s pretty much all that there is. I’m giving it a generous 3 star. 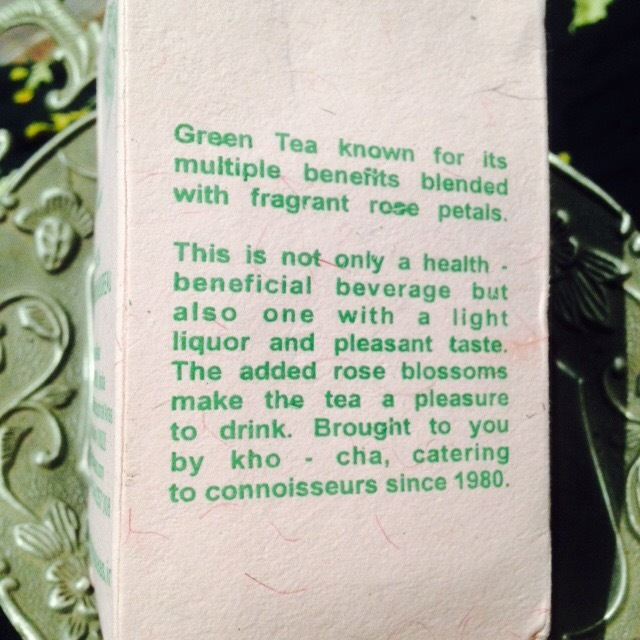 You could source this from their website http://www.khochateas.in or most probably try to find a kho-cha tea boutique near you. I found my tea at “Golden tips”,Phoenix market city,whitefield, Bangalore. Just In case you would wanna know how I made the brew. Here’s the rocket science recipe. I usually boil my water and cool the water to 75 degrees. How do I know that? I do the finger dip test. Dip your pinky finger and if it’s hot but bearable, you have the perfect temperature. I add the teaspoon of leaves and just let them uncurl and wait for 3 minutes roughly. Strain it through. Add a teaspoon of honey and add a saffron strand for a spot on taste. If I’m in an adventurous mood I build up more flavours like cinnamon, lime,black pepper,etc. Now Go ahead and get kho cha ing.. 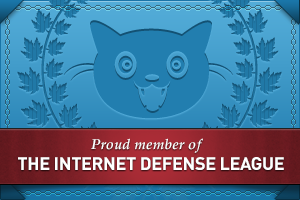 THIS BLOG CONTAINS COPYRIGHTED MATERIAL, EXCEPT FOR THE MEME’S USED FOR PARODY UNDER “FAIR USE”,EVERYTHING ELSE IS MINE TO CREDIT.